Jerome Wetzel TV: Glee finishes the "Journey to Regionals"
Glee finishes the "Journey to Regionals"
This summer, I'll be going back to review the season one episodes of FOX's Glee. These are fresh reviews, not reposts, and I hope you will enjoy reliving the first season with me. It's with both relief and sadness that the summer of season one Glee reviews reaches its end. The finale of the FOX hit, "Journey to Regionals," sometimes wrongly listed as "Journey," is just about a perfect episode, and thus provides some closure for the first year of one of television's most original series. In the finale, the New Directions compete in Regionals, and lose. Romance is explored, and a baby finds a loving home. 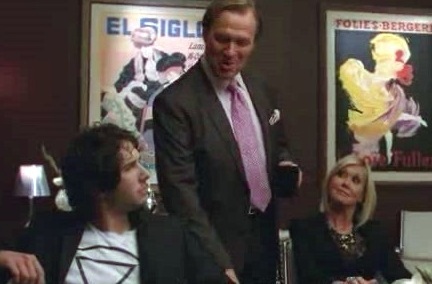 Sue (Jane Lynch) even grows a heart. In the tradition of Glee, it's all about feeling good. 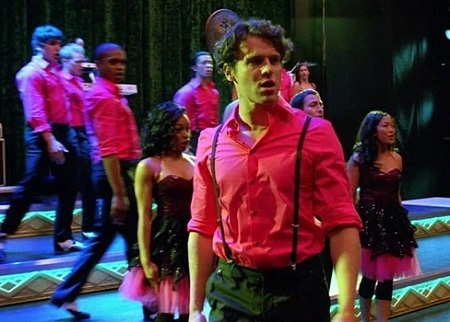 As the episode begins, the New Directions are devastated to learn that Sue has been named to the all-celebrity judging panel for the Midwestern Regional Show Choir competition. Feeling like this means an automatic loss for them, and s Figgins (Iqbal Theba) has vowed to disband the club if they come in last, the whole group spirals into depression. It's up to Will (Matthew Morrison) to raise their spirits, reminding them that it's all about the fun of the journey, not the results. Finn (Cory Monteith) separately convinces Rachel (Lea Michele) that they must step up and lead in this dark hour, which brings them back together as a couple. So the New Directions do not lack direction. Because of the journey theme, Will decides that they will perform only Journey songs for Regionals. This ties into the episode title nicely, and this whole season has been about the "Journey to Regionals" for the kids, anyway. They absolutely slay "Faithfully," a mash-up of "Anyway You Want It / Lovin', Touchin', Squeezin'," and, of course, a new version of "Don't Stop Believin'," which features more soloists. It's a triumphant performance set, made all the better because the kids finally look and feel like a real show choir group. Their costumes may be cheesy, but they capture the spirit. The audience, made up of Glee fans, roar their approval. OK, so maybe a show choir audience wouldn't rise to their feet, or cheer Puck (Mark Salling) just for opening his mouth. So it is kind of obvious that these are fans of the series, and not just extras lined up to fill seats. But that also makes their enthusiasm real, and the young actors feed off of it, delivering a fantastic performance. The authenticity comes through on screen, leading to a more powerful set. So it's a good decision, even if threatens continuity. The only question left is, how do they possibly come in third place? That can be explained by the judging panel, and we're not talking about Sue here. Olivia Newton John and Josh Groban return to play terrible versions of themselves, the former even claiming to be offended that only one group honors her in song. Rod Remington (Bill A. Jones) is back, too, strangely, since that makes two people from McKinley's area in a regional celebrity judging panel. All three call into question Sue's status as a celebrity. Never mind that Rod is a local newscaster, and Sue is a nationally known coach, so she is arguably more famous. They also trash the New Directions, Newton John wondering if they come from a "poor school." And they lump Sue in with the kids as people that try hard, but just don't have the talent to make it. Sue is personally offended, but she also feels bad as an educator. No matter what one says about Sue, and there is plenty to bust her on, at the end of the day, she cares about kids. She is generally portrayed as tough because she thinks that is what will help them succeed. As much as she hates Will, even Sue knows how hard the New Directions work. Faced with equally heartless judges, she rebels, and votes for the New Directions for first place. Though her one vote is not enough to keep them from finishing last. It's a devastating blow to the New Directions' egos, after what they consider their best performance to date. They are sent home where the group will be disbanded. Will packs up his room, and the kids sing a tearful "To Sir, With Love" goodbye to thank him for how he has touched all of their lives. Even Matt (Dijon Talton) gets to speak up with a rare line. Finn says Will is a father figure. Sue witnesses all of this, and knows that she cannot possibly allow the club to go under now. As tough as she is, she knows this is just too much for the kids to take. So she blackmails Figgins to reinstate them for another year, telling Will she is worried about losing a nemesis. It's a thin excuse, and Will sees her for what she is being - a nice person - and calls her on it. Sue denies it, and status quo is reinstated. To celebrate, Will sings "Over the Rainbow" to his ecstatic group. Perhaps somewhat surprising is Emma's (Jayma Mays) reaction at the threat of no more New Directions. She screams at Figgins in his office, something that seems out of character for her, but under the circumstances, works. Will knows it must be about more than the students, and confesses his love to Emma, despite her having an, as yet unseen, new dentist boyfriend. He even kisses her, something the actress Mays didn't know was going to happen, and so her shocked reaction is genuine. This leaves a hanging thread all summer, as the audience wonders if Emma will dump her new guy for Will. Spoiler: she won't. Interestingly, one of only three groups (see my previous complaints about the competition system in earlier reviews), Aural Intensity, is not shown singing. We hear them only briefly, and see them just at the awards. Characters also talk about how much better the New Directions already are than Aural Intensity. This is a little strange, because Aural Intensity is seen as a serious competitor in season two, one that is a real threat to the New Directions winning. Perhaps it would have been better to not re-use this group name next year. Vocal Adrenaline is shown performing. This allows one last showcase of Jesse's (Jonathan Groff) talents in a large, sweeping version of "Bohemian Rhapsody." It's fantastic, even though, as Rachel correctly asserts, he doesn't show much heart. Even better, the number is intermixed with scenes of Quinn (Dianna Agron) giving birth, and some of the lyrics even make sense with the cut scenes they are paired with. This deepening has the affect of making the whole number mean much more. Quinn's life comes together just in time for the baby. Mercedes (Amber Riley) and Puck, as well as the rest of the glee club, stand by her side for the event. Quinn's mother (Charlotte Ross) even shows up to right her wrong, saying she kicked Quinn's dad out, and wants Quinn and the baby to come home with her. Given those circumstances, one might think Quinn would choose to keep the baby, providing an all around happy ending. Instead, in a very sad moment, Quinn decides that it will be better if she doesn't keep the infant, which Puck goes ahead and names Beth. It's a mature decision for a high schooler to make. Rachel gets one more scene with her mother, Shelby (Idina Menzel), congratulating her on her group's performance, but asserting, apparently wrongly, that the New Directions are better. Perhaps she just means that the New Directions are on an upswing, while Vocal Adrenaline is coming down. But either way, Rachel asks Shelby to switch to McKinley and co-coach the glee club. She declines, dashing Rachel's last hope that they will form a mother-daughter relationship. This is a little odd, because Shelby cites that she will be leaving glee club coaching to raise a family. She knows she's missing something important from her life, and seeks to correct that imbalance. That's all well and good, and it's great that Shelby takes baby Beth. But shouldn't she also include the family she already has? It's a slap in Rachel's face for Shelby to say that she wants a family, but not offer her biological daughter a place in the structure. Hopefully that will be corrected with Shelby's upcoming season three arc. And so, there you have it. Lots of emotion, lots of wonderful singing, and a nice wrap up to a number of large arcs. There are still things to look forward to in season two, such as seeing Rachel and Finn together, and how Quinn will reinvent herself. But it's a neat ending, properly finishing off the first chapter of a bold television experiment. Make sure you tune tomorrow at 8 p.m. ET for the season three premiere of Glee on FOX. If you like my reviews, please follow me on Twitter! Click here for all of my Glee reviews. To purchase Glee DVDs, streaming episodes, music, and more, please click here. 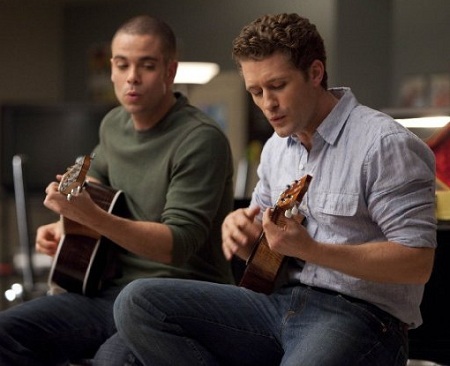 Article first published as TV Review: Glee - "Journey to Regionals" on Blogcritics. Some Happy Endings for "Blax, Snake, Home"
Archer journeys to the "Heart of Archness"
Glee declares "I Am Unicorn"
Gossip Girl answers "Yes Then Zero"
American Dad! gets into "Hot Water"
Family Guy comes down with "Lottery Fever"
The Cleveland Show longs to be "BFFs"
Fringe is "Neither Here Nor There"
Community enrolls in "Biology 101"
Grey's Anatomy is "Free Falling" and "She's Gone"
Does Body of Proof "Love Thy Neighbor" ? Glee embarks on "The Purple Piano Project"
Glee goes into a "Funk"
The Vampire Diaries celebrates "The Birthday"
The Secret Circle - "Pilot"
Up All Night - "Pilot"
Glee gets a case of "Laryngitis"
Glee has a "Bad Reputation"
Torchwood: Miracle Day follows "The Blood Line"
Suits gets in a "Dog Fight"
Burn Notice is not "Dead to Rights"
Glee channels "The Power of Madonna"
Futurama is living proof of "Reincarnation"
Wilfred doesn't define its "Identity"